Webber Cemetery is just off Rt.34..
Rt. 34 is the main hwy that runs through Galatia. Rt. 34 is also one of the main hwys that com out of Harrisburg. Regardless the cemetery will be easy to locate using landmarks. If you come through Galatia on Rt.34e, once you leave the city limits it will only be about 2.5-3 miles. When you go about 2 miles out you will come to a downhill drop and immediate back uphill rise. This is the "spillway" to Harrisburg Lake. As you come back up the hill you will see the American Coal Co. Mines and the long stretch of mine belt that overpasses the highway. at the top of the hill there will be a white house on your Right. Turn Right on the road in front of the house. 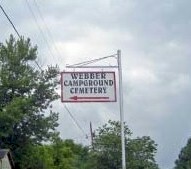 Webber Cemetery is about 1/8 mile down on the right. the road you take to the cemetery is actually a mine access road for guards and etc. not to heavily trafficked. if you are still on the hwy and you drive under the min belt that stretches over the Rt.34 you went to far!! Obviously now if Coming in on Rt.34 from Harrisburg, you will definitely see the mines from far away. Once you leave Harrisburg City limits it is close to 7 or 8 miles before you reach the mines. This time go under the Overpass Mine belt on Rt.34 and as soon as you get cleared from under it hit your blinker to the left. As soon as that fence line ends there is that white house you turn in front of. 1. Watch the semi's coming in and out on the road directly under the mine belt.. ..They have an issue with paying attention. 2. The deer in this area are the only thing worse than the semi drivers at not paying attention, that's because they think they have the right of way on the roads. regardless if they pay taxes or not. 3. Most of all ~~ regardless the time of year, the season, the weather, time of day, etc.... IF you are going to be in this part of the country, Make sure you stop at Walmart, Dollar Store, etc. before leaving town. and invest in a large purchase of "OFF"/"CUTTER" or something to that effect. The Mosquitoes that are produced from the bodies of slew water at the mines can be compared in size with birds. They are HUGE...If you come in the summer time, we dont have "lightening bugs" we have flashlight bugs" they make awesome night lights..lol but really no joke on the "OFF". In the dead of winter here and i have been bitten by them. This is only a PARTIAL list of those buried at the Webber Campground Cemetery found from stated references below. I have since obtained a complete listing. Email me if you'd like me to do a look-up. Irvin, Benjamin Franklin. M - W - Md. Age 66 y 4 m 4 d. Farmer. d. 21 Dec 1889, Hamberg. b. New York. Ill res - 49 y. bd. Webber Camp Ground, 23 Dec 1889. Son of Oscar also d. 4 Mar 1859 Age 3 m.
Jones, John Co E 56 Ill Inf 24 Apr 1844 – 20 June 1930 Here lies a loyal Union soldier.